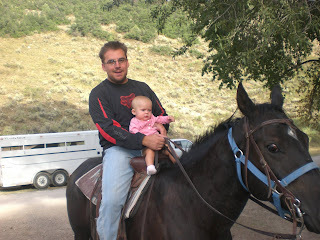 Over Labor Day we went camping in Utah with my family up Diamond Fork Canyon. It was alot of fun. 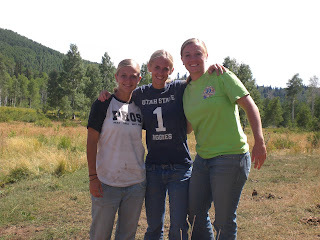 We went horse back riding, four-wheeling, hiking to hot pots. I was glad to be able to spend time with the whole family together. 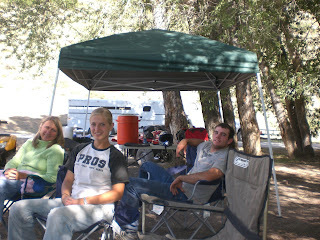 Below are pictures of the trip. 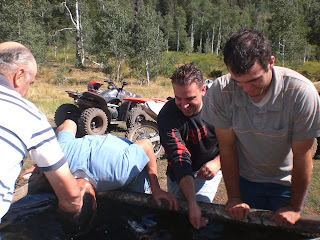 On the 4-wheeling trail we found this cow trough type of thing the cows drink out of. The water was freezing cold and the boys thought they would dip their heads in it to cool off. Perry said he would give my brother Bret 10 bucks to get in it. Of course Bret did it- He'll do anything for money I guess. It was pretty funny. You can see the cow trough just above this picture. 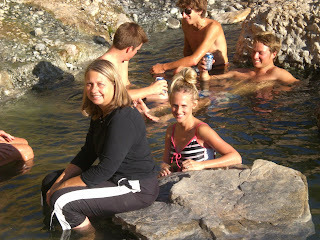 So while we were camping we (mom, Bret, Perry and I) went on a beautiful hike to some hot pots. It was soo pretty and fun, much better than our previous experience. 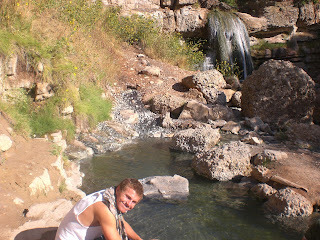 A couple years ago we did the same hike and yikes! at the top there were a bunch of naked people, so we turned around and went back. This was a much better experience as there was not a naked person in sight, thank goodness. The pots were like a hot tub. I loved it. Below are some pictures. My brother Bret hanging out in the hot pot. Look at the beautiful waterfall behind him. Mom and I chillin in the hot pot. Yes- it was very nice and warm. Logan finally has a crib. I have no idea why it took me so long to get one, but at least she has one now. She has been sleeping well in it. She currently goes to bed around nine and doesn't wake up until 7:30. (knock on wood) She is definitely a morning person. 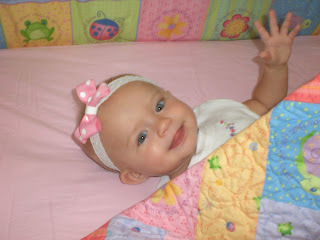 The best is getting her out of the crib in the morning and her giving me the biggest smile you have ever seen. It melts my heart. 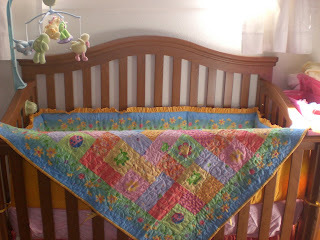 Anyway I am posting these pictures for my mom to see how cute the crib bedding she made looks. Yes-she made it all- very talented I must say. kudos to you mom- I love it.